This is a very straight forward rendition of Yang Style Long set. It was our first video and it is plain and simple. Linda Darrigo demonstrates the entire set broken into six sections. She also shows basic stances and positions. The set is then followed by applications of the basic energies and movements exhibited by Ted Mancuso and Pat Templeton. This tape was created as an inexpensive memory aid. Teachers wanting to purchase lots may contact us for wholesale information. 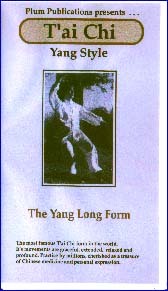 NOTE: We have recently added over 17 minutes to this tape with a rendition of the entire Yang Tai Chi performed by ShihFu Ted Mancuso himself. The price of the tape is the same as before.